Arnold Schwarzenegger has built his career on negating suspension of disbelief. He plays characters with comically Anglo names like Ben Richards and Howard Langston, despite looking and sounding exactly like an Austrian ex-bodybuilder. He’s good at squinting, smirking, and standing up while keeping his back straight, but not at convincing the viewer that he’s anyone other than Arnold Schwarzenegger. His screen appeal lies in his un-believability. He’s incapable of disappearing into a role (though he comes close in The Terminator). Instead of becoming the character, the character becomes him. That’s the central conceit of his comedies; the humor depends on the viewer recognizing Schwarzenegger and thinking that it’s funny to see him do something un-Schwarzeneggerian. This is also the reason why most of his comedies are pretty bad. Yet, despite his non-existent range, Schwarzenegger has continually taken on projects that either cast him as a character with multiple identities (Raw Deal, Total Recall, True Lies, Escape Plan) or require him to play multiple characters (The 6th Day, the Terminator franchise). This results in a Hollywood hall of mirrors: Schwarzeneggers interacting with other Schwarzeneggers; Schwarzenegger pretending to be Schwarzenegger; Schwarzenegger discovering that he’s not the Schwarzenegger he believed himself to be, but a different, identical Schwarzenegger. No movie takes the multiple-Schwarzenegger trope further than Last Action Hero, an elastic meta-action-comedy that was considered a resounding commercial and critical failure in 1993. The victim of its own marketing campaign, the movie made $137 million at the box office (equivalent to about $222 million in today’s dollars), but still managed to lose money, because so much had been spent on advertising. Rather, the reason why Last Action Hero didn’t become a massive blockbuster rests in the film itself. It’s a mutant that can’t be categorized, both a straightforward action movie and a Joe Dante-style gag-a-minute fantasy. It doesn’t make much sense. It’s the only truly funny comedy of Schwarzenegger’s career, and it’s overtly about Schwarzenegger, and yet none of its best jokes are related to Schwarzenegger’s screen persona. At times, it’s brilliant and demented. 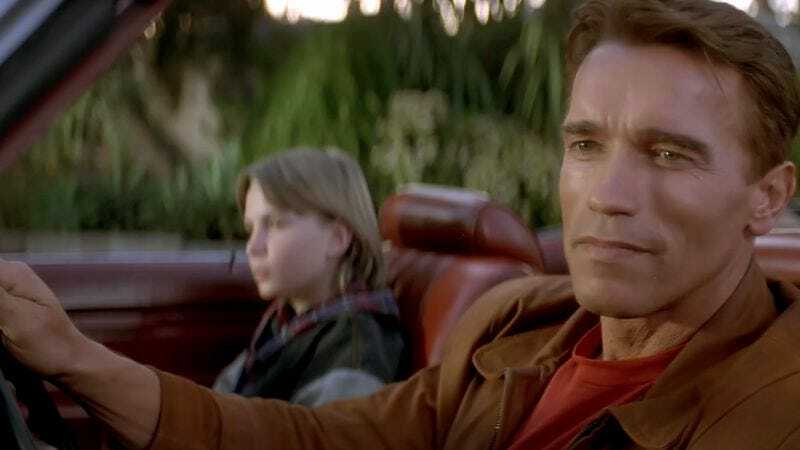 When Last Action Hero opened, one of the most common complaints made by critics was that the film—about a boy who magically enters a Schwarzenegger movie and then brings its protagonist back with him into “reality”—didn’t properly distinguish between the real world and the world of the movie-within-the-movie, and never defined the parameters of either. For instance, after Danny (Austin O’Brien) gets sucked into the fictional Schwarzenegger vehicle Jack Slater IV, he discovers that characters from other movies, like Terminator 2: Judgment Day’s T-1000 (Robert Patrick), also inhabit this universe. But if T-1000 is a real person in the movie-within-the-movie, then why does Terminator 2 also exist in the same world (albeit as a Sylvester Stallone vehicle)? If Schwarzenegger’s Jack Slater loses his invulnerability upon entering Danny’s “real” world, then why do other movie characters—like Death (Ian McKellen) from The Seventh Seal—retain their powers after getting freed from their movies? And why does Danny’s world seem so fake, as choked with in-jokes and movie references as Jack Slater IV? Last Action Hero began as a straightforward parody of action movie clichés. College buddies Zak Penn and Adam Leff wrote the original script, but once Schwarzenegger became attached, it was handed over to David Arnott and Shane Black. (Penn, who is outspoken in his dislike of the finished film, later became a successful screenwriter in his own right; he would revisit the meta-movie territory of Last Action Hero in Incident At Loch Ness, a mockumentary starring Werner Herzog as himself.) With the involvement of Schwarzenegger, then the world’s biggest movie star, and Black, action movies’ most famous screenwriter, it seemed natural that the John McTiernan (Die Hard, Predator), the greatest action director of the era, helm the project. Like his contemporaries Tony Scott and Michael Mann, McTiernan represented a new breed of genre stylist. Half a generation earlier, style-conscious directors like John Carpenter and Brian De Palma had burst on the scene; their work was formally exaggerated, but rooted in classicism, with style functioning as a way to distort the viewer’s perspective. Carpenter’s shock reveals and De Palma’s split-screens were audience-control effects. The camera served to create and manage a relationship between the audience and the fictional action onscreen. Scott, Mann, and McTiernan, however, were more formalist; reared on European art cinema, they’d found their way into commercials and TV and then into mainstream genre filmmaking. For better or worse, they had developed visual sensibilities before developing narrative ones. They fetishized formal qualities—lens flares, smoky textures, shallow depth-of-field—the way Carpenter had fetishized people clumped together by danger or De Palma had fetishized anxiety. Visual motifs grew into themes, instead of the other way around. Though McTiernan had begun in theater (he’d studied stage directing at Julliard), his approach was more textural than dramatic. The camera-viewer relationship was different, too; the image didn’t act as an intermediary between the action and the audience. Compositions were off-kilter; abstract visual qualities were emphasized. Perspective didn’t matter. Visual impact and rhythm did. After taking over the script from Penn and Leff, Black and Arnott piled Last Action Hero with references. Jack Slater’s chief (Frank McRae) is named after Fred Dekker, who directed the Black-penned Monster Squad. Tom Noonan, another Monster Squad alumnus, appears as himself and as The Ripper, the antagonist of Jack Slater III. Jack Slater IV is credited to Franco Columbu, Schwarzenegger’s best friend from his bodybuilding days. The movie-within-a-movie’s feuding mobsters are named Antonio Vivaldi and Giuseppe Torelli. There are deliberate continuity errors throughout the film, and two different parodies of the iconic overhead fall from McTiernan’s own Die Hard. In the scene from Jack Slater III that opens the movie, Tina Turner plays the mayor of Los Angeles—a parody of stunt Hollywood casting that is itself a piece of stunt Hollywood casting. (Pointing out clichés while indulging in them is Black’s specialty.) The riffs—many of them obscure—go on and on. The obvious answer as to why Last Action Hero doesn’t tonally distinguish between “reality” and Jack Slater IV is that both worlds are meant to register as fictional. Danny’s world is one where magic exists, where New York grindhouses advertise classic B oddities like Screaming Mimi and Chinatown At Midnight on their marquees, and where Arnold Schwarzenegger has a popular franchise where he plays an L.A. cop named Jack Slater. Like Schwarzenegger fighting himself (the best iteration of which happens during the movie premiere climax of Last Action Hero), it isn’t about a confrontation between the real and the imaginary. There’s no strictly defined perspective; neither world is believable, and thus neither is supposed to control the audience’s point of view. Instead—and this is why I think Last Action Hero has aged so well—what the viewer is presented with are different kinds of ridiculous fiction meshing together. It allows the movie to be completely elastic in terms of style and realism. The result is funny in the same way that Chuck Jones cartoons (referenced in the film, of course) are funny. Because everything in the Last Action Hero is malleable, the humor no longer rests in the violation of rules (which don’t exist) or screen personas, but in the imaginative co-mingling of intentional crassness and non-logic. Danny gets transported into Jack Slater IV in the middle of a car chase. Slater shoots a bad guy, who gets thrown into an ice cream truck, which then promptly explodes. Cue another bad guy keeling over, with an ice cream cone lodged in the back of his head. “I iced that guy,” says Slater, before adding: “To cone a phrase.” I laugh every goddamn time, but not because the scene successfully satirizes a trope that I, the viewer, am familiar with. I laugh because of a complex interaction of intentionally unreal and parody elements, of things I recognize and things that ignore both common sense and physics. The scene activates that part of my brain that wants to figure out order and purpose, that wants to manage reality, and briefly shorts it out, resulting in a big, unsuppressed guffaw. Explaining what Last Action Hero is like, and how it works, is easier than explaining what it’s about. In 1993, it was common for critics to observe that the movie was pointless. The only lesson Danny learns from his adventure into the movie-verse is that magic is real, which is, frankly, a terrible lesson. Slater, having discovered that he’s a fictional character, resolves to no longer follow Hollywood hero-cop rules and become an ordinary police officer like he always wanted, which is good for him, but doesn’t really apply to the real world. Clearly, if there’s something at the core of the movie, it isn’t being expressed through the plot (which is self-consciously generic) or the characterizations. And since pure escapist fluff doesn’t exist, that something has to be contained in the movie’s comic sensibility, in the perspective-less elasticity of the style. The top three highest-grossing films of 1993 were, in order, Jurassic Park, Mrs. Doubtfire, and The Fugitive. Like most popular fiction, these films break certain rules in order to maintain others. In Jurassic Park, a set of rules is outlined (barriers protect visitors from the dinosaurs, can’t reproduce, etc.) and then deliberately broken so that one rule (“life finds a way”) can be followed through the end. (Careful viewers will notice that the movie’s second act is outlined in the helicopter scene, when Alan Grant fastens together two female seatbelt ends.) Mrs. Doubtfire revolves around a social taboo (cross-dressing) being violated in order to fulfill a parental duty; in The Fugitive, a rule (imprisonment) gets broken so that another one (justice) can be followed. I’m not denigrating any of these films, except maybe Mrs. Doubtfire. They were produced for a culture that functions according to legal and social rules. And, as such, this culture—our culture—finds rule-breaking entertaining and rule following emotionally satisfying. Which, of course, is why Last Action Hero could’ve never become the massive success its producers hoped it would be. What makes the movie special also doomed it: Though it satirizes narrative rules, it never completely adheres to one. Its reality is wonky. One of my favorite sequences in the film starts with Danny sitting in a classroom in his world. The teacher puts on Laurence Olivier’s Hamlet. As Danny grows bored, the Olivier movie dissolves into an imaginary adaptation starring Schwarzenegger, full of references to his meta-fictional Jack Slater character. This parody (which is, I should say, pretty damn funny) dissolves into Chuck Jones’ Road Runner cartoon Fast and Furry-ous; a slow zoom out reveals that Danny is watching it on his TV set. Within the space of a few minutes, the movie goes from a fictional reality to a real fiction to a fictional fiction to a cartoon and then back to the fictional reality again, all in the service of gags and “visual melodies.” The fog around Elsinore turns into a puff of cartoon smoke. As fiction, it’s messy and nonsensical. As filmmaking, it’s pure.